Something allied modelers are desperately in need of is a new tooled Universal Carrier in 1/35 scale. However while we are waiting (and not holding our breath) Graham Sellars of Resicast is busy devising sets to bring the old Tamiya kit up to scratch. 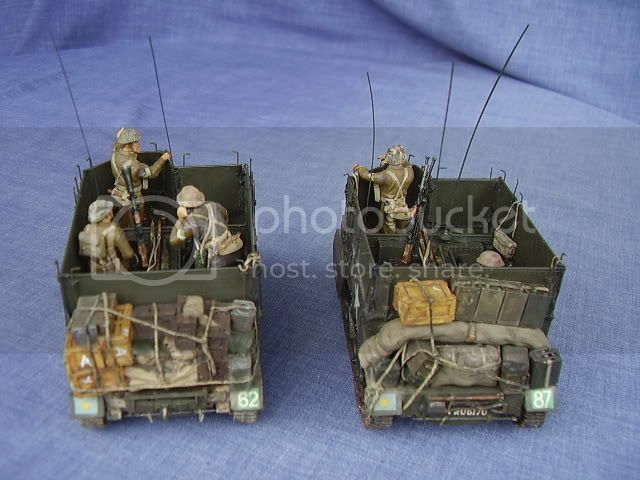 This stowage set is designed to give your Universal Carrier that lived-in look common to front line vehicles. •	Inner stowage block A- a pile of stowage cast together for the inside of the carrier that includes 3-4 tarpaulins and .303 ammo boxes. •	Inner Stowage block B -Tarpaulins over 3in mortar boxes topped by ammo cans. •	Inner Stowage block C- a pile of cast together compo ration crates and ammo boxes. •	Replacement suspension parts to enable the modeler to give his carrier an overloaded look. •	Rear stowage block no 1 this is built up of ammo boxes, tarps, compo crates and Jerricans all lashed together with rope. •	A replacement front panel with a camo net, a loosely draped tarp and a can cast in place. The instructions come as an A4 sheet printed on both sides. There is a photographic key to the stowage parts as well as wartime photos of carriers, and photos showing the stowage in place on the kit. Beware the photos show parts from other Resicast carrier conversions that are not in this kit so pay attention to the photographic key. There are also some instructions as to the fitting of the replacement suspension parts. Although this isn't a full build review I did cut most of the parts away from the resin pour plugs and test fitted them to the Tamiya kit. The large rear stowage blocks come away from their pouring plugs very easily, I just scored each side of the plug and snapped them off. The inner stowage pieces can actually be left as they are. It means they will sit a bit higher than meant to but you can always say there is a folded tarp underneath. I sanded and cut the pouring plugs away on mine and it only took a few minutes work. I have a few different razor saws but the best for work like this I use my JLC 002 Combo Saw. I dip my saw in water which lubricates the blade and also makes the dust form into a slurry and not become airborne. I also dip any pieces I have to sand into water for the same reason. At the end of the session I just throw the sand paper away. The plugs on the ammo boxes, tarps etc also came off with little hassle. I always wash any resin pieces prior to painting so any remaining dried slurry will come away then. The large rear stowage blocks fit into place quite neatly on the Tamiya kit but I had to cut away the two raised half cylinder bumps on Tamiya part C17 and leave out the two Tamiya A21 parts to help with the fit. Rear stowage block 1 has some nicely detailed ropes holding everything in place but the other block, which has a lot of stacked crates and boxes, shows no rope and one definitely needs to be added. The inner stowage all fit though there are some tabs on the inner surface of the carrier walls that could be cut away to make the stowage fit more snugly. The replacement front panel, Resicast part 3 –front deck stowage, didn’t quite fit and there was a small gap at the top which will need to be filled. If you don’t use this part there is a spare stowage box (Resicast part 4) that can be mounted on the Tamiya part. The replacement suspension parts fit a bit looser than the Tamiya parts and you can use them to show an overloaded suspension. I’m going to split this set between two carriers, one of which will also have the Resicast Deep Wading set (subject of a future review) added, so I didn’t glue any of the stowage in place. This is another very useful vehicle specific stowage kit from Resicast and with a bit of work can transform the Tamiya Universal carrier into an overloaded carrier as seen in many wartime photos. Highs: Diversity of stowage, quality of casting. Lows: Poor fit of replacement front panel. Also cutting away pour plugs can produce a lot of dust so be careful.